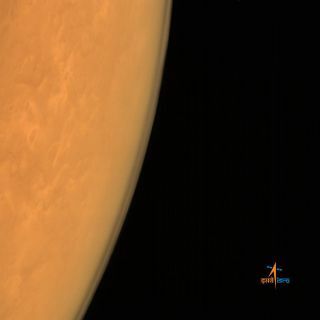 India's first Mars orbiter Mangalyaan captured this photo of the Martian atmosphere just after arriving at Mars on Sept. 24, 2014 Indian Standard Time. The Indian Space Research Organisation released the image on Sept. 25. This photo is the first image of Mars from India's Mangalyaan orbiter after its arrival at the Red Planet. The Indian Space Research Organisation released the photo on Sept. 24, 2014.